Brisbane-based innovation firm Tritium has officially opened its first overseas premises in Torrance, California. The company, which manufactures the award-winning range of Veefil fast chargers for electric vehicles (EVs), said the facility will service both the North and South America regions and will focus on technical customer support, local manufacturing and R&D. “Since we launched our first Veefil fast charger in 2013, North America has been one of our largest markets,” said Tritium’s Commercial Director, Mr Paul Sernia. He said the opening of the US office will allow the company to build a local network of partners trained to install and service the Veefil range. “We will also manufacture our chargers in Torrance which, combined with a growing local network, will bring new jobs into the region,” Mr Sernia added. He said the the move will become “the blueprint” for the company’s planned international expansion. “We intend the US facility to become the blueprint for further international offices opening in the near future,” Mr Sernia concluded. Established 15 years ago, Tritium is a specialist designer and manufacturer of fast chargers for EVs, power-electronic systems and battery energy-storage applications. Its products are operational on every continent around the world and are to be found in submarines, UAVs flying at over 40,000ft and even working in the extremes of Antarctica. 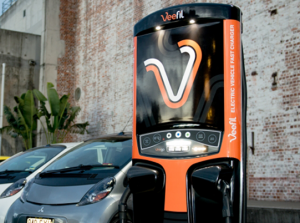 In May 2013, the company launched an award-winning, 50 kW DC fast charger for electric vehicles – the Veefil® – which is now being installed globally on major charging networks and fast-charging highways.